Parizeau died late Monday night at the age 84, an avowed sovereigntist until the very end and a would-be founding father of a nation-state that never emerged. Though he’ll be remembered for his sneering referendum-night comments that ‘money and the ethnic vote’ doomed the separatist effort, his career was far more textured than one night’s unfortunate comments. The new PQ leader, Pierre Karl Péladeau, elected just last month, used the occasion of Parizeau’s death to suggest that it will give Quebeckers an opportunity to reconsider — and embrace — the independence movement afresh. Though René Lévesque founded the Parti québécois and served far longer (1976-85) as Québec’s premier than Parizeau (18 short months between 1994 and 1996), it was Parizeau who, in the words of Lady Macbeth, screwed the party’s courage to the sticking place. After Lévesque lost the initial 1980 effort to secure the province’s independence and, four years later, formulated the ‘beau riqsue‘ approach that sought accommodation with Canadian federalism, Parizeau, Québec’s long-serving finance minister, promptly left the party and Lévesque’s government. Four years later, Parizeau returned to the PQ as its leader and in 1994, he won a majority government and served premier in his own right, establishing the conditions to hold the second, more contentious, independence referendum. A former central bank official, Parizeau didn’t come from the traditional hard-left background that has come to define the Parti québécois in recent years. That puts him in the same complex category as his contemporary, Lucien Bouchard, a conservative who left federal politics as a top ally of then-prime minister Brian Mulroney. 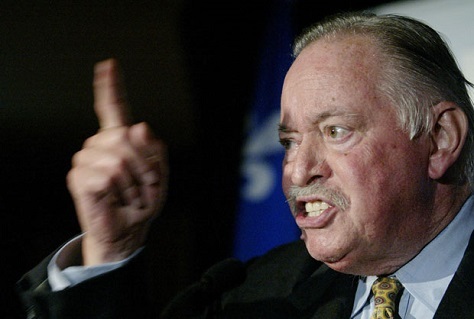 Parizeau would ultimately cede control to the smooth-tongued Bouchard in the 1995 referendum as the chief spokeman for the ‘Oui’ campaign, and Bouchard succeeded Parizeau as premier upon the latter’s resignation the day after the referendum loss. The party’s new leader, Peladeau, also has a unique political pedigree — he entered politics only last year after heading Quebecor, the province’s leading media company. Unlike the most recent PQ premier, Pauline Marois, Parizeau spoke flawless English and urged young Quebeckers to become bilingual. Critics argue that Parizeau’s vision for Québec left it burdened with a state-heavy economy with onerous regulation, public-sector ownership and hostility to Anglophones, all of which ill equipped the province to compete in the globalized 21st century. There’s more than some truth to that criticism. Though the St. Lawrence Seaway probably would have boosted Toronto as Canada’s eventual financial capital, at Montréal’s expense, Québécois separatism may have accelerated the trend. But Parizeau, whose family’s roots date back to the earliest days of New France, never gave up on the cause, even as he grumbled about each of his successors — most recently, in April, Parizeau lamented that the PQ had ‘lost its soul,’ that the party had been ‘demolished’ and faced a ‘field of ruins.’ In retirement, however, Parizeau tended to a vineyard in southern France. In the final days of the 1995 campaign, French president Jacques Chirac signaled that a successful outcome would bring recognition, and Parizeau had readied comprehensive diplomatic and economic plans to be deployed in the event of a successful outcome — including, it’s rumored, France’s diplomatic recognition the following day. Though he failed to achieve the chief goal of his life’s work, many of the institutions of modern Québec bear his impression — notably Hydro-Québec, the state hydroelectricity company and the Caisse de dépôt et placement du Québec, the province’s pension savings and investment fund. Premier Philippe Couillard, the leader of the Parti libéral du Québec (PLQ, Liberal Party of Québec) who ousted Marois’s minority PQ government last spring, acknowledged Parizeau’s oversized role by confirming that the province would hold a state funeral for him and announcing the Caisse’s headquarters will be named in his honor.